"Web Player for Spotify™" is a Chrome application to load the official Spotify web player inside an isolated window. 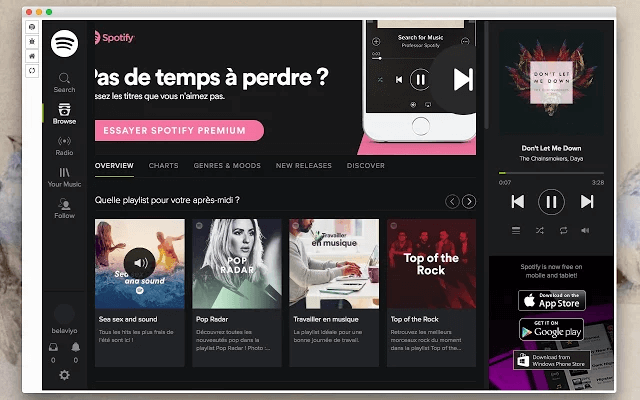 This application can be used instead of the desktop version of Spotify as it supports almost all the desktop version's features. Note that the web player is loaded in an isolated (sandboxed) window which cannot interact with your browser hence you need to login into the player one more time. For extension version, there is an isolated iframe instead of webview and hence there is no need to login again if you already logged-in in your browser once. What is "Web Player for Spotify™" extension and how does it work? Web Player for Spotify™ used to be a Chrome packaged application to access the official Spotify web player's user interface in a sandboxed window. This application can be used when the desktop version is not supported in an operation system, or when you do not have permission to install the desktop version. The web player has almost all the features the desktop version has. As of version 0.2.0, the packed application is transformed into WebExtension and all known music listening issues are fixed. Do I need to have any external software to run the "Web Player for Spotify™" extension? No, Web Player for Spotify™ add-on can be installed if you have a modern browser like Google Chrome or Firefox on a computer. Note that the web player requires Adobe Flash Plugin to work properly. Spotify Web still uses Flash over the HTML5 player. So in order to play songs in the application, make sure you have an up-to-date Adobe Flash plugin. Check https://get.adobe.com/flashplayer/ to make sure your Flash version is up-to-date. What options do I have in the left side menu? You can open Spotify web UI in a browser window, open the bug reporter, open this FAQs page right from the left side menu. Why Web Player for Spotify™ application uses sandbox isolation? Chrome applications can append a browser element into their UI. This browser element has no interaction with the user's browser for privacy reasons. So you can even login into the web player with another credential as the one you already have in your browser. Will "Web Player for Spotify™" add-on be available for Firefox browser? Yes, finally I rewrote the extension and now it is available for Firefox as well as Opera browsers. Use the download section on top of this page to find links! I am getting "Flash Player is not enabled" message when open the application window in the Chrome browser. How can I fix this? Open chrome://settings/contentExceptions#plugins in a browser tab. Add [*. ]spotify.com in the Hostname pattern field then press Enter key. Now refresh the window using the built-in button or close and reopen the window. Can I perform music player actions without the need to bring the Spotify window up? As of version 0.2.0, it is possible to use right-click over the toolbar button to pause, resume, switch to next or previous track right from the browser toolbar. Also in Chrome and Chrome like browsers, you can define custom keyboard shortcuts for all these actions. Just head to chrome://extensions/configureCommands and configure your custom keyboard shortcut for each action. Note that there is no pre-defined shortcut for these player actions.